As summer soon ends and the kids start returning to school we wanted to thank all of you for making the past few months in Willmore oh so GREAT! We hope to you will join us at these exciting events happening in and around the Willmore neighborhood this month, especially walking with WCHA in the Latin American Parade. Cheers to a fantastic Labor Day with tons of BBQ, good times, and staying cool. 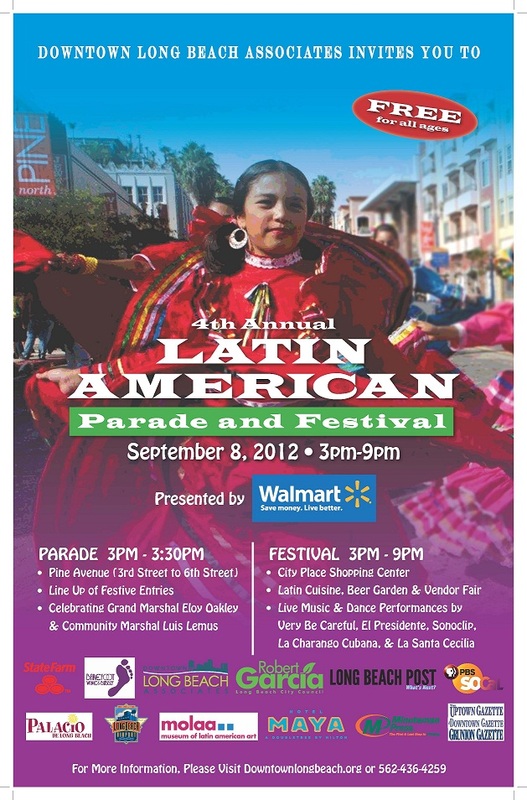 Latin American Parade + Festival: Walk in the Parade with Willmore! Willmore City Heritage Association is participating for the first time in the 4th Annual Latin American Parade & Festival! Share your neighborhood love + pride by walking with WCHA in the PARADE! That’s right, wear your Willmore gear, perfect your wave, and prepare that smile for a memorable stroll down Pine. The PARADE is from 3pm – 3:30pm and kicks off on Pine Avenue at 6th Street. Join us after the parade at the Willmore booth to share the joys of living in such a great place and promote all that is great about WCHA. The festival will feature live music and dance performances will take place throughout the day on two stages and a children’s activity area will feature a variety of activities to keep the kids entertained. AIA and Long Beach Heritage are excited to announce a Discussion Series on “The Future of Long Beach”. Their first topic is, “What are the possibilities for our Civic Center?”. Please join them on Monday, September 10 at 7pm at the Aquarium of the Pacific. Tickets are $5 and are available by advance purchase only at www.aialb-sb.org/events. More info can be found at the AIA website, on the attached flyer, or on Facebook, including more about our speakers! DURING THE HEYDAY of the Arts and Crafts movement in America, Charles and Henry Greene took an intensely artistic approach to design, creating some of the most beautiful residences in the history of architecture. We are fortunate to have a number of examples of their work still remaining in Long Beach, most prominently, the Tichenor House on Ocean Blvd. Please join the Willmore City Heritage Association for a viewing of Paul Bockhorst‘s documentary: Greene & Greene: The Art of Architecture . The featured homes include Adelaide Tichenor’s house here in Long Beach, as well as the Blacker and Gamble houses in Pasadena, the Charles Pratt house in Ojai, the William Thorsen house in Berkley, the D.L.James house in Carmel, and the Walter Richardson house in Porter ville.